Figure 1-Fibonacci. Image: Public domain, via Wikimedia Commons. Born around the year 1175 in Pisa, Italy, Leonardo of Pisa (more commonly known as Fibonacci) would have been 840 years old this year! (Can you guess the two indexing numbers between which Fibonacci’s age falls?) The son of a customs officer, Fibonacci was raised in a North African education system under the influence of the Moors. Fibonacci’s fortunate upbringing and educational experience allowed him the opportunity to visit many different places along the Mediterranean coast. It is during these travels that historians believe Fibonacci may have first developed an interest in mathematics and at some point come into contact with alternative arithmetic systems. Among these was the Hindu-Arabic number system – the positional number system most commonly used in mathematics today. It appears that we owe a great deal of respect to Fibonacci for, prior to introducing the Hindu-Arabic system to Europe, the predominant number system relied on the far more cumbersome use of roman numerals. It is interesting to note that while the Hindu-Arabic system may have been introduced to Europe as early as the 10th century in the book Codex Vigilanus, it was Fibonacci who, in conjunction with the invention of printing in 1482, helped to gain support for the new system. In his book Liber abbaci, Fibonacci explains how arithmetic operations (i.e., addition, subtraction, multiplication, and division) are to be carried out and the advantages that come with the adoption of such a system. Figure 2-Golden spiral. Image: Weisstein, Eric W. “Golden Spiral.” From MathWorld–A Wolfram Web Resource. Whereas the number system most familiar to us uses the relative position of numbers next to each other to represent variable quantities (i.e., the 1’s, 10’s, 100’s, 1000’s, … place), Roman numerals rely on a set of standard measurement symbols which, in combination with others, can be used to express any desired quantity. The obvious problem with this approach is that it severely limits the numbers that can be reasonably represented by the given set of symbols. For example, the concise representation of the number four hundred seventy eight in the Hindu-Arabic system is simply 478 in which “4” is in the hundreds place, “7” is in the tens place, and “8” is in the ones place. In the Roman numeral system, however, this same number takes on the form CDLXXVIII. As numbers increase arbitrarily so does the complexity of their Roman numeral representation. The adoption of the Hindu-Arabic number system was, in large part, the result of Fibonacci’s publications and public support for this new way of thinking. Can you imagine trying to do modern mathematical analysis with numbers as clunky as MMMDCCXXXVIII??? Me either. Thanks, Fibonacci! 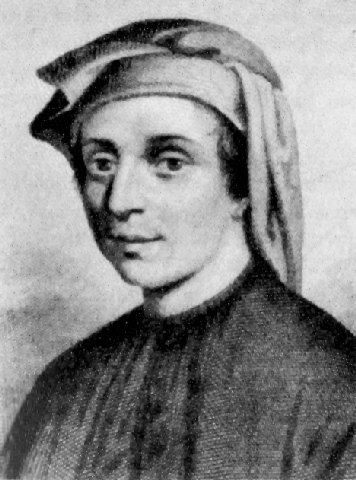 Fibonacci’s other works include publications on surveying techniques, area and volume measurement, Diophantine equations, commercial bookkeeping, and various contributions to geometry. But among these works nothing stands out more than that of Fibonacci’s sequence – yes, we have returned! Among the more interesting mathematical properties of Fibonacci’s sequence is undoubtedly its connection to the golden ratio (shall be defined shortly). To illustrate, we look momentarily at the ratios of several successive Fibonacci numbers. Beginning with F1=1 and F2=1 we see that the ratio F2/F1=1. Continuing in this manner using the recurrence relation (*) from above or any suitable Fibonacci table we find that F3/F2=2, F4/F3=3/2, F5/F4=5/3,F6/F5=8/5, F7/F6=13/8, F8/F7=21/13, … As the indexing number tends to infinity, the ratio of successive terms converge to the value 1.6180339887… (the golden ratio) denoted by the Greek letter phi. We may thus concisely represent this convergent value by the expression as the lim n–> infinity (Fn+1/Fn). Studied extensively, the golden ratio is a special value appearing in many areas of mathematics and in everyday life. Intimately connected to the concept of proportion, the golden ratio (sometimes called the golden proportion) is often viewed as the optimal aesthetic proportion of measurable quantities making it an important feature in fields including architecture, finance, geometry, and music. Perhaps surprisingly, the golden ratio has even been documented in nature with pine cones, shells, trees, ferns, crystal structures, and more all appearing to have physical properties related to the value of (e.g., the arrangement of branches around the stems of certain plants seem to follow the Fibonacci pattern). While an interesting number no doubt, we must not forget that mathematics is the business of patterns and all too often we draw conclusions and make big picture claims that are less supported by evidence and facts than we may believe. There is, in fact, a lot of “woo” behind the golden ratio and the informed reader is encouraged to be weary of unsubstantiated claims and grandiose connections to the universe. It is also worth mentioning that, using relatively basic linear algebra techniques, it is possible to derive a closed-form solution of the n-th Fibonacci number. Figure 3-Computing the 18th Fibonacci Number in Mathematica. 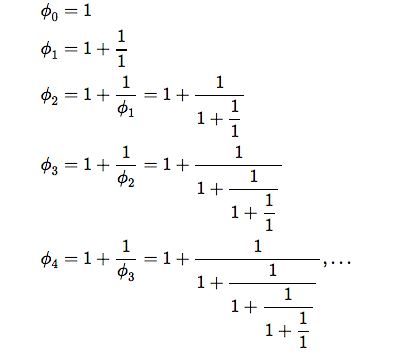 Omitting the details (see link for thorough derivation), the n-th Fibonacci number may be computed directly using the formula Fn=((φ)(n+1)+((-1)(n-1)/(φ)^(n-1))/((φ2)+1). While initially clunky in appearance, this formula is incredibly useful in determining any desired Fibonacci number as a function of the indexing value n. For example, the 18-th Fibonacci number may be calculated using F18=((φ)(18+1)+((-1)(18-1)/(φ)^(18-1))/((φ2)+1)=2584. Comparing this value to a list of Fibonacci numbers and to a Mathematica calculation (see picture above), we see that the 18-th Fibonacci number is, indeed, 2584. Without having to determine all previous numbers in the sequence, the above formula allows us to calculate directly any desired value in the sequence saving substantial amounts of time and processing power. From the study of syllables and poetic forms in 12th-century India to a closed-form solution for the n-th Fibonacci number via modern linear algebra techniques, our understanding of sequences and the important mathematical properties they possess is continuing to grow. Future study may reveal even greater mathematical truths whose applications we cannot yet conceive. It is thus the beauty of mathematics and the excitement of discovery that push us onward, compel us to dig deeper, and to learn more from the world we inhabit. Who knows, you might even be the next Leonardo of Pizza – errrrr Pisa. What patterns will you find? French mathematician Edouard Lucas (1842-1891) was the first to attribute Fibonacci’s name to the sequence. After which point little is ever mentioned of the Indian mathematicians who laid the groundwork for Fibonacci’s research. Answer: n=15 –> 610 and n=16 –> 987. Medieval Muslim inhabitants of the Maghreb, Iberian Peninsula, Sicily, and Malta. Knott, Ron. Who Was Fibonacci? N.p., 11 Mar. 1998. Web. 27 Apr. 2015. “Moors.” Wikipedia. Wikimedia Foundation, n.d. Web. 27 Apr. 2015. Leonardo Pisano – page 3: “Contributions to number theory”. Encyclopædia Britannica Online, 2006. Retrieved 18 September 2006. “Famous Mathematicians.” The Greatest Mathematicians of All Time. N.p., n.d. Web. 28 Apr. 2015. Grinfeld, Pavel. “Linear Algebra 18e: The Eigenvalue Decomposition and Fibonacci Numbers.” YouTube. YouTube, 2 Dec. 2014. Web. 28 Apr. 2015. Figure 1: Fibonacci. Digital image. Wikimedia Foundation, n.d. Web. 27 Apr. 2015. Figure 2: Golden Spiral. Digital image. Mathworld. Wolfram, n.d. Web. 1 May 2015. Figure 3: Ross, Andrew Q. Closed-Form Computation of Fibonacci. Digital image. Mathematica, 28 Apr. 2015. Web. 28 Apr. 2015. This entry was posted in Math and Nature, Numbers and tagged Fibonacci, Fibonacci Sequence, Golden Ratio on May 5, 2015 by andrewqross. Right next to learning your A B C’s you learn your 1 2 3’s. Both have a similarity in that they are forms of communication, but do not exist. The purpose of numbers was so that things could have meaning and value . We have big numbers, small numbers, numbers over numbers called fractions. Numbers that are bigger than zero, numbers that are smaller than zero, numbers that go backwards known as negative numbers and ones that go forwards called positives. We can manipulate numbers with other numbers to make bigger or smaller numbers. Some numbers go forwards so impossibly forever that we can’t put a value to them, only a symbol and a name. These numbers can also go forever backwards too, represented with a dash in front of the symbol. There are imaginary numbers and a number to represent nothing. Numbers can be used to create patterns or code to mean something. Computer language is called binary, which reads only 1’s and 0’s. Numbers can also create patterns themselves. Sequences are a set of numbers, sometimes they have a pattern and other times they do not. An arithmetic sequence is a pattern that increases or decreases steadily. 1, 3, 5, 7, 9… is an arithmetic sequence that is increasing by 2 every time. Geometric sequences have a pattern that increase or decrease by the same value but don’t necessarily increase or decrease steadily. 2, 4, 8, 16, 32… is a geometric sequence that is multiplied by 2 every time. Arithmetic and Geometric sequences are fairly common and easy to grasp. Other common patterns are square and cube patterns (1, 4, 9, 16, 25… and 1, 8, 27, 64, 125…), which are just patterns in the numbers. Some patterns incorporate numbers and pictures. Start by dividing one number in the fibonacci sequence by the number before it. (3/2=1.5, 5/3=1.66, 8/5=1.6, 13/8=1.625, 21/13=1.615…) Notice how all the numbers start getting closer and closer together towards the same number 1.618? Much like Pi which written shorthand as 3.14, Phi is written shorthanded as 1.618, (although both are irrational and can’t be written out completely in decimal form because they lack an end). Phi is known as the golden number. The significance of this number is that it is an irrational number. Because of the irrationality of phi, it can’t be written as a fraction which is what makes them vital for plants in nature. Sunflowers are the easiest to see Fibonacci numbers in. Plants take in light from the sun which means in order to be a good plant and survive, you need to show as much “skin” (leaves/seeds/petals) as you can without overlaps and gaps. The center of sunflowers grow their seeds in a spirally kind of pattern. These seeds rotate from the next at 61.8% (Phi!) of a full rotation, (or about 222.5 degrees). This angle of rotation gives planets the optimal conditions to fit the most seeds in the smallest area possible with the smallest amount of gaps. If one was to take the time to count the seed in a spiral the Fibonacci numbers would appear again, 34 seeds counterclockwise and 55 seeds clockwise. (http://www.mathsisfun.com/numbers/nature-golden-ratio-fibonacci.html) But sunflowers aren’t the only plants to have Fibonacci numbers. Other plants have it; pinecones, pineapples, cauliflower/broccoli tops, are a few examples. As for the ideal human face the myths and the facts are harder to distinguish. The idea isn’t does the human face have the golden ratio in it. The idea is, will an ideal (perfect/attractive) face be made of the ratio. Tons of research has be done to both prove and disprove it, but more evidence suggests that an ideal face will have the golden ratio. Would this suggest that the human mind favors the ratio? Is our mind pre programmed to favor items with the ratio? If so then the mind would favor a form of order in an unorganized (irrational) number. I would think that irrational numbers would make anyone cringe to look at (Or at least I do, and I know I can’t be the only one). There’s no end to them, and they can’t be put into a nice even fraction. That instantly makes them not nice. So why would the mind favor a ratio that is irrational? In my 9th grade science class we were all required to do a science fair project. I ended up doing mine on soundwaves and when directed at a curve can be heard great distances away despite the volume of the sound. Some friends of mine did theirs on Phi. They wanted to see whether people would favor items in a room that were of the golden ratio versus those that were not. They drew two rooms in a one point perspective, one with Phi the other just slightly off. They would ask people which room they liked more. Next they drew different forms of furniture (couches, tables, chairs, wardrobes) in the same manner. One being Phi the other just a little off, and asked everyone individually which they liked more. What they found was that more people favored the room and items that were the golden ratio over those that were not. Keep in mind this was an experiment done by high school students in 9th grade, that does not make it an a perfect experiment. But it is an interesting idea to ponder upon. The digits of Phi written into the symbol of Phi. This entry was posted in Math and Nature and tagged Fibonacci Sequence, Golden Ratio, Num83r5, Phi on November 1, 2014 by haleysquared.